Campus & Parking maps here. The 5th grade girls will be participating in a cross-curricular science and art field trip on Tuesday, April 2. As part of the 5th grade science curriculum on water pollution, treatment, and conservation, we will be visiting the Southeast Water Treatment Plant located in Philadelphia in the morning. In the afternoon, we will be traveling to both the Barnes Foundation and the Rodin Museum. We will traveling to and from school by bus. We will leave SCH directly after advisory and return in time for regular dismissal by 3:30 PM. Students should bring a snack and a bagged lunch, including a refillable water bottle. We will eat lunch together on the beautiful grounds of the Barnes Foundation. Students should wear full SCH uniforms but should wear comfortable walking shoes. Please dress appropriately for whatever the weather holds, as we will be walking both inside and outside. Dates: Fridays on April 5, 12, 26, May 3, 10, 2019. PSC Members: $12 per session or $60 and commit to all 5 sessions. Non-members: $15 per session or $70 and commit to all 5 sessions. Drive by the Upper School science building parking lot this Sunday and stop in for a car wash for a good cause! The baseball team is holding a fundraiser for the Alabama tornado victims. Rain date: April 14. The cost will be $20 for a wash, plus an optional $5 for interior work. Witness the magic within Springside Chestnut Hill Academy’s walls through this intimate glimpse into our Lower School division. See the energy of our teachers and students first-hand as you dip into classrooms, and learn more about our unique offerings, such as the Center for Entrepreneurial Leadership, robotics, arts and new media, all housed on our green, 62-acre campus located on the edge of Philadelphia. All parents of 9th and 10th grade students are invited to an evening discussion of the college process. Bring your questions. The Guest Speaker is TBA. After the speaker, all 10th grade parents are invited to stay and meet in a group with your child's college counselor. We look forward to welcoming you to campus for our Inside SCH Open House. Witness the magic within Springside Chestnut Hill Academy’s walls through this intimate glimpse into our Middle and Upper School divisions. See the energy of our teachers and students first-hand as you dip into classrooms, and learn more about our unique offerings, such as the Center for Entrepreneurial Leadership, robotics, arts and new media, all housed on our green, 62-acre campus located on the edge of Philadelphia. This meeting is an information session for parents of students who currently participate in or will participate in Chamber Singers, Chamber Ensemble, and Jazz Ensemble in 2019-20. In partnership with Children's Book World, SCH is proud to host Chelsea Clinton on her Philadelphia book tour for Don’t Let Them Disappear: Twelve Endangered Species Across the Globe. PLEASE NOTE: Tickets MUST be purchased in advance HERE. ONLY PEOPLE WHOSE NAMES HAVE BEEN SUBMITTED WILL BE ADMITTED. Your ticket to the event will admit a family (up to four people) and includes one copy of Don't Let Them Disappear. Chelsea's other books will be available for purchase at the event. Only books purchased from Children's Book World will be signed. To ensure that we get through everyone in line, memorabilia or her parent's books will not be signed. Our spring play is D.W. Gregory’s Radium Girls. After the turn of the 19th century, radium was a miracle cure and a key component in the luminous glow-in-the-dark watches which were the latest rage—until the factory girls who painted them began to fall ill with a mysterious disease. 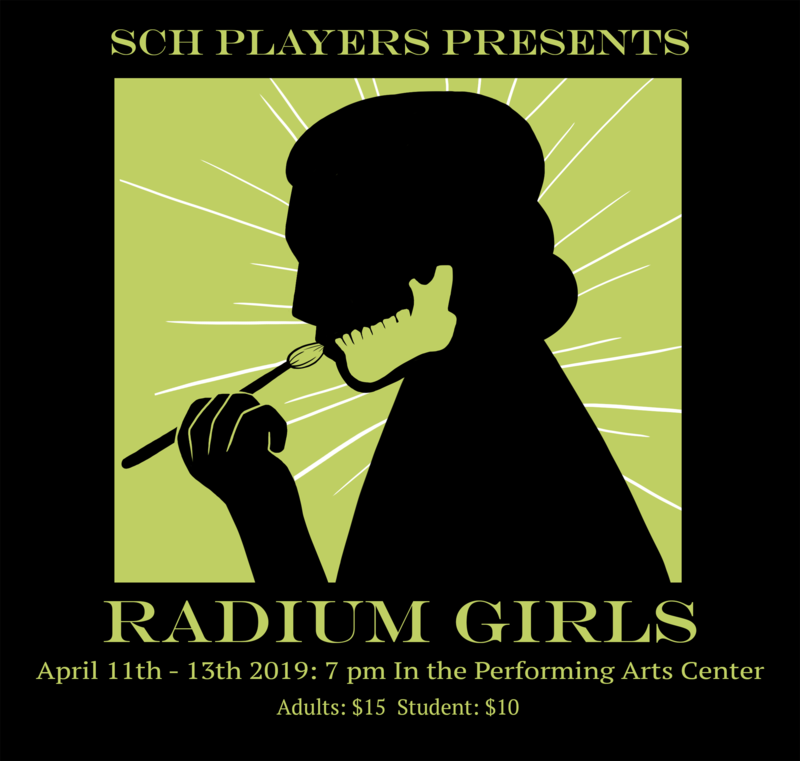 Inspired by a true story, Radium Girls traces the efforts of Grace Fryer, a dial painter who has fallen ill with radium poisoning, as she fights for her day in court for settlement against her former employers. The show focuses on the implications of American consumerism, corporate "bottom line" mentality, factory working conditions, scientific research, and safety laws at the turn of the century through this powerful and engrossing drama. Outward Bound leadership and senior leaders will be here to answer your questions and provide more information about the experience. Private Music Lesson Program students perform a recital featuring their work. Students of all levels are permitted to perform with consent of their private lesson teacher or their classroom music teacher. Free of charge, all are welcome! Need coverage for your Lower School student? A parent or guardian must accompany each boy on this overnight camping trip with Mrs. Booth's homeroom. Girls need to pack a waste-free lunch. Douglas will be sharing details about our time in the Vare Field House and will be available to answer any questions you may have. Celebrate the Arts at SCH! all other student works on Cherokee Campus. A toast to seniors will take place @ 6 PM in the Crawford Gallery, followed by their artist talks. A parent or guardian must accompany each boy on this overnight camping trip with Ms. Xavier's homeroom. 4th grade girls will visit in 5th grade Math, History and English classes during the morning. Blue & Blue Day is a beloved tradition and special day for our boys and their families. If you have a dark or light blue warrior in the house, please come out and support your son. At 11:50 AM, Pre-K will start the procession from the Jordan Building to Landreth Field. Parents are invited to flank the parade route and congregate by the entrance to the Exchange. The day will conclude at 2 PM with awards. The Willow Grove cafeteria will be closed on this day. Middle and Upper School boys have the option to pre-order a hoagie (and chips) using a form sent to their school email OR bring a lunch from home. Lower School boys need to bring a lunch from home. SCH Academy is a test site. Students taking the SSAT must first register here. A parent or guardian must accompany each student on this overnight trip with Mrs. Stieffenhofer's homeroom.